Located 3km inland from Arambol, a village in the Northern most part of Goa near to the Mahrastra border, we are in a green and lush village area away from the loud sounds of the beach nightlife. A perfect haven for self-reflection and relaxation, we welcome you to your home away from home. By Air: Book your flight to the Goa Dabolim Airport (GOI). 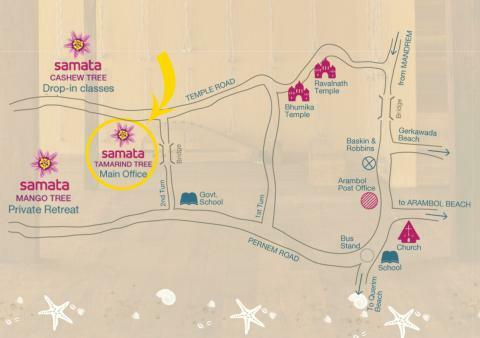 Samata is 1.5 hour drive from the airport. We recommend flying direct into Goa if possible to avoid the long and arduous process of transfering from International to Domestic Terminal in Delhi or Mumbai. If traveling from Europe or abroad, Qatar airlines has flights direct into Goa. Air India operates a flight direct from Dubai. Thomson a direct flight from the UK, and Condor direct flights from Munich. We are happy to offer advice for travel into Goa; just ask. By Train: The closest train stations to Samata are Pernem Station or Tivim Station, which are 30-45 drive away. Vasco and Margao stations are around 1.5 hours away. By Bus: The closest bus station to us is Mapusa, 30 minutes away; Panjim station is also convenient, only 45 minutes away. TAXIS : Taxis are readily available at all airports, train stations, and bus stations. Once you book with us, we will give you detailed instructions how to arrange your own taxi transfer to Samata as well as suggested prices you will have to pay. We will give you all of our contact information and maps so that your driver will deliver you safely to our oasis.